Most of us have family heirlooms of some kind: clothing, photographs, jewelry, handicrafts or other objects that have been in the family for a while. Unfortunately, we don't always take the time to care for them properly. We keep them hidden "safely" away in musty boxes, or stacked on dusty shelves. The stories behind our heirlooms are often hidden in our memories instead of shared with loved ones. If we don't take care of and document our heirlooms, we don't get to enjoy them as much (and neither do our relatives). We risk these precious objects ending up in an estate sale someday because nobody else knows what they are. But that doesn't have to happen! Follow these easy, practical tips for organizing your heirlooms in your very own family archive. A family archive is an organized collection of heirlooms and meaningful documents. Every family should have a collection like this--not just rich or famous families. The objects don't have to be valuable to anyone but your family. They don't have to be well-rounded collections; it might be just a hodge-podge of things handed down. The purpose of a family archive is to gather, document and preserve those objects for current and future generations to enjoy. Gather (or at least list) every family artifact you have: documents, books, photographs, clothing, quilts, jewelry, dishes, artwork, yearbooks, tools, timepieces, uniforms, medals, toys, artwork, handicrafts, collections and more. This step might take five minutes or five months, depending on how scattered your collection is, and how extensive. You may need to sift through household files and attic boxes to pull out the family pieces. But it's an essential first step: you can't organize and take care of items that have been forgotten on a basement shelf. You also don't want to make important decisions about which heirlooms get priority care or conservation until you've listed them all out. If you have a lot of family possessions, you may need to whittle your collection down. Most of us have limited climate-controlled storage space and limited funds for archival storage supplies (read more about this below). Would you rather keep lots of unidentified clutter that has deteriorated in improper storage, or would you rather preserve and pass on fewer, nicer, fully identified heirlooms? Keep one-of-a-kind artifacts (a hope chest), sample pieces of collections (the least rusty of grandpa's license plate collection), items with personal meaning (a baby blanket), objects made by your family (a wooden bowl), and objects you can use or display in your home (artwork or furniture). Don't keep duplicate items, like double sets of photo prints and collections that don't mean much to you. Don't keep collections you're not interested in maintaining. Photograph or inventory them, then divide, donate or sell. A good rule of thumb is that when a collection's value is largely sentimental (like grandma's everyday dishes), it is probably best to divide it among relatives so everyone shares the good memories. However, keep a collection intact when its primary value is historical, artistic, or collectible; the value may be diminished if the objects are separated. Once you've decided what to keep, it's time to document it. Otherwise, your heirlooms will gradually lose their meaning over time, as memories fade and generations pass on. What kinds of information should we document? 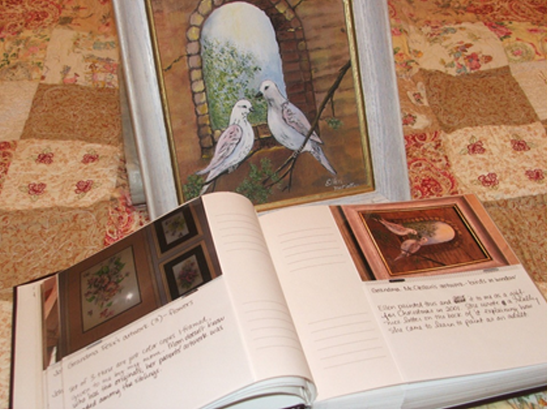 Different people choose different ways to share their heirlooms' stories. My grandmother gave me a framed crochet sampler a few years ago. She wrote a detailed description on the back that included the name and birthdate of my great-grandmother, who created the sampler; when the squares were likely made; and the fact that my grandma had owned them since my great-grandmother's death in 1964. The advantage of this kind of documentation is that it stays with the artifact. Another option is to create a list of artifacts and each one's history, either in a document or photo album. My heirloom inventory is done in a photo album (shown below). I take pictures of artifacts, which I place in the album along with caption cards describing the stories behind them. Sometimes I add photos of the heirloom in use, like my daughter wearing her infant blessing gown. The album is mentioned in my will so that those who administer my estate can consult it. This isn't a foolproof system: the description is physically separate from the object itself. But it's an excellent way to catalogue an entire household of heirlooms. Always wash and dry your hands before you handle your heirlooms. Your hands are dirtier than you know! Clean your heirlooms only with caution, according to a conservator's instructions or methods you find in a reputable book on preservation. Keep original documents and photographs in folders or albums made from archival papers (acid-free, lignin free and buffered) and/or inert plastics (polyethylene, polypropylene, polyester). Do not use adhesives on original documents or photographs; don't cut or crop them. Don't surround them with stickers or other items that may damage them with residues, abrasion, etc. Make digital and print copies of originals for sharing and display. Separate materials that are causing damage or may cause damage to each other. For example, remove tie tacks or pins from clothing, and photos or news clippings from between the pages of books. When potentially damaging objects cannot be physically separated, like items glued to a scrapbook page, insulate them from each other with a layer of archival tissue. 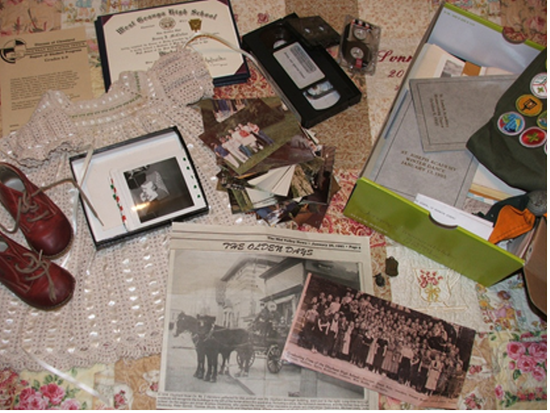 Package these items that belong together in the same container or take a picture of them together so their shared history is preserved. Purchase archival supplies from a reputable archival vendor. (Just because a storage container at your local discount store says "archival" doesn't mean it's safe for your heirlooms.) Such vendors include (but are not limited to): Gaylord, Hollinger Metal Edge, Inc., Light Impressions, Talas, and University Products. Cushion or wrap items in archival tissue or appropriate fabrics (consult the conservation books), then in archival cardboard or inert plastic boxes. Some archivists avoid inert plastic boxes because any moisture in your heirloom will be trapped inside the container. Store containers in a room-temperature, low-humidity, bug-free environment. For example, an interior closet with no plumbing in the walls (no stuffy attics, cold garages, or moist basements). If you store items in a cedar closet or wooden trunk, nest heirlooms inside archival boxes that will buffer them from any negative effects of the wood. Consult a professional conservator about how to care for particularly valuable or unique artifacts. The American Institute for Conservation of Historic and Artistic Works can help you find a conservator and and even gives tips on hiring one. You can find conservators with expertise in everything from paintings to photographs, documents, textiles, digital and electronic media and more. Don't rush the process of documenting and caring for your heirlooms. Enjoy it! Sorting your heirlooms gives you the chance to relive precious or tender memories, or think about family members long gone who once owned these objects. Recording stories that go with these objects is one way to write your family history. Showing your heirlooms to others strengthens ties between living loved ones and passes the stories forward. When you've finished the process, your organized family archive and its legacy will be a treasure all its own.